Finally, the documentary has been shot, edited and completed. It is called One Size Fits All. It is now in the hands of the printers to be shipped here for December 3. 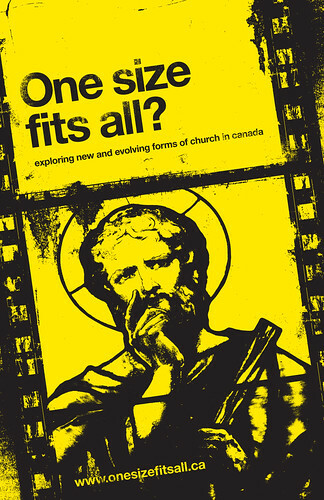 For the last year and a bit Joe has laboured over this documentary traveling across Canada interviewing people at churches that are doing work on the fringes of culture and ministry. There is some great churches and people on this film that have in many ways influenced how we express ourselves here in Sarnia. I’m proud of Joe for putting this together. It’s quite a large project to tackle for it being your first film. Get yourself a copy of the film pre-ordered here. Every DVD you buy helps cover the expenses of making a film like this. The package also includes a bonus CD with the original soundtrack of the film. All the songs were written and produced by Driving on City Sidewalks, our favourite band to use for all our films, cause their local and amazing and they write us original stuff. Here is a list of the interviews that made it on to the final cut. Congrats to all your team on the imminent release of your documentary! I have pre-ordered my copy (thanks for the convenient link, and the effortless ordering process). Looking forward to watching it, with friends.